Russia's longest section of the border with Ukraine, a section of some 700 km, is in the Rostov Region. In recent weeks, there has been significant movement of troops in and out of this area. Kommersant correspondent Ilya Barabanov reports on the situation on the border. On April 1, the press service of the Russian Defense Ministry announced that a battalion of the 15th Motor-Rifle Brigade, which had been stationed in the Rostov Region for an exercise, had left the area and was on its way to its permanent base in the Samara Region. 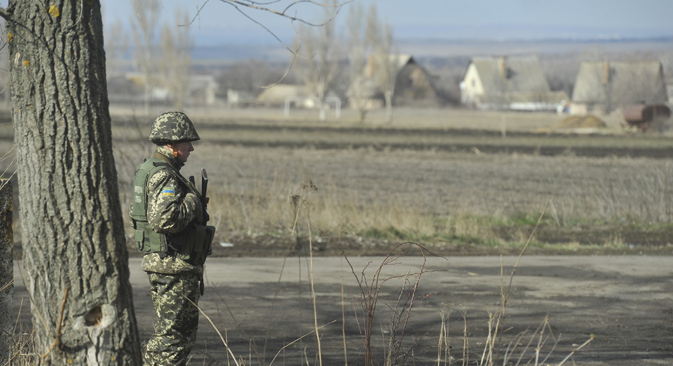 Yet, although the military contingent on the border with Ukraine is being reduced, the presence of the military in the border area is still very much felt. There are military trucks moving towards the border. Local residents in Taganrog say that ahead of the referendum in Crimea, a lot of military vehicles and hardware passed through on its way toward Ukraine and they have not returned yet. "On the other hand, had they been planning something serious, they would have moved all the hardware at night instead of dragging it across the city in the light of day," points out a local journalist, Yevgeny Fridman. The exercise, which is supposed to have ended, seems to be still going on. There is a military training range near the hamlets of Kuzminka and Chkalov, 130 km from the border, where between March 11 and 14, an airborne troops drill was held, involving some 1,500 paratroopers and dozens of pieces of military hardware. At the training range itself, numerous vehicles and pieces of hardware can still be seen near the command post. "Access to this facility will be banned for several more days," a serviceman guarding the entrance to the range told our correspondent. The serviceman said he was a cadet and they had been brought to the Rostov Region on an alert in early March. "I am supposed to be taking exams now. But there is so far no clarity as to when we shall be sent back home. There are new orders coming every day. The latest one said that we may leave here in a couple of days," he said. In the north of the region, the situation is completely different. In the town of Novoshakhtinsk near the border, there are no servicemen or military vehicles. There are rural roads stretching from Novoshakhtinsk to the north, along the border, parallel to the Don highway. In recent weeks, work has been under way to widen them, with new asphalt being laid on some stretches. I wanted to cross the border at the Izvarino crossing in the town of Donetsk [not the large city in eastern Ukraine, but a small town in Russia’s Rostov Region –Ed.] to travel, via Luhansk and Kharkiv, to the Russian-Ukrainian border in the Belgorod and Kursk regions. Drivers at the local bus station told me: "We are trying not to go across the border in vehicles with Russian license plates. You'd better cross the border on foot and take a bus there to Luhansk." Russian border guards warned me that one in two men with Russian passports are not allowed to cross the border into Ukraine. I spent an hour and half in the company of their Ukrainian counterparts. The questioning was recorded on a video camera: "Where are you heading? How often have you been to Ukraine in recent months? How much money are you carrying with you? Who do you know in Kiev?" In the end I was not allowed to cross the border on the grounds of "lack of confirmation of a planned stay on Ukrainian territory." Returning to the bus station, I learn that no special measures to step up security have been taken in the town in recent weeks. Just a couple of holiday homes have been prepared for the eventuality of refugees arriving from Ukraine. But there are very few of them here. In the village of Zolotaya Kosa, some 20 km from Taganrog, people arriving from Ukraine have for two weeks now been kept in a children's sanatorium called Romashka on the coast of the Azov Sea. There are just 34 people here, mostly from Ukraine's southeast regions. Each family has been given a separate room and are being provided with three meals a day. A family of 14 have arrived in Rostov Region from Nikolayev. The head of the family, refusing to name himself, explains why they have decided to flee Ukraine. "Extremists are looting, beating up Russians, carrying out armed attacks on buses," he says matter-of-factly. He says that the Ministry of Labor in the Rostov Region is looking for jobs for the new arrivals but the local authorities are in no hurry to grant them the status of political refugees, let alone Russian citizenship. "There is nothing to do there. There is no work, nobody is building anything, not knowing what tomorrow will bring. I was not even able to sell my old car, as nobody is willing to spend any money." According to him, the majority of people now staying at Romashka have become refugees not because of some threat to the Russian-speaking population of Ukraine but because they have heard on TV that, reportedly, the moment you cross the border and say that you are a refugee, you are given Russian citizenship, provided with housing and some allowance. "However, here we were immediately told that we would not be given either a passport, political asylum or refugee status. The local authorities promise to help with finding work and are offering various options. For example, I was offered the job of a KamAZ truck driver at a local farm and my wife, the job of milking cows at the same farm. However, first we need to have a work permit, while the Federal Migration Service requires numerous documents, to get which we'd need to go back to Ukraine," he says. According to Artem, two of the refugees, having encountered similar problems, have already returned home. He and his family intend to stay in Russia and try and find work here.